There are certain vineyard sites up and down the Côte d’Or in Burgundy which have been recognised for centuries as being outstanding locations. The monks were usually the first to spot the potential and to stake a claim. One such is the Clos de la Perrière in Fixin, just north of Gevrey-Chambertin, founded by the monks of Cîteaux in the early 12th century. The Joliet family purchased the Manoir de la Perrière and its attendant vines in 1853. Bénigne, who has bought out other family members so as to be able to run the domaine as he wants to do it, is the 6th generation of the family. He has moved towards organic farming in the vineyards, reduced yields and developed a style of vinification and barrel maturation to suit this vineyard. From the 2009 vintage the wines are aged for 24 months in barrels, half one year old and half two year old. Various early wine authorities in the 19th century singled out Clos de la Perrière as an exceptional vineyard, Dr Lavalle (1855) noting it as a Tête de Cuvée making wines which kept for longer than any others of the Côte d’Or. Though attempts to have it classified as Perrière-Chambertin in the 1930s failed, Bénigne is about to start work on a dossier to propose Clos de la Perrière as a grand cru now. Up to 10,000 bottles are made each vintage, with young vines being declassified into village Fixin. There is a small amount of white made as well from the coolest part of the vineyard. Punchy purple in colour, there is a little reductive touch to the nose. The red fruit offers beautiful, sweet fruit, harmony and persistence: this is really impressive. With real bounce and vigour, this is one for those who do not know Fixin to discover. Bénigne Joliet began picking on 20th September, for four days, then went back to finish a late-ripening plot on 27th. He chose not to extract much because the colour and fruit were emerging easily in the vinification tanks of their own accord. The produce of the young vines and the vin de presse have been declassified. Clearly there is the necessary attention to detail here. Mid ruby. Hedonistic nose – very alluring. Very sweet and almost brûlée. Nothing 2013 about this – a great success for those looking for fairly early pleasure! A central core of purple, but whether in colour, bouquet or palate, this wine retains an essentially old-fashioned style. This is not silky and suave but it is complex, spicy and profound. The fruit in the mouth, in particular, has predominantly red depth, with some brambly, peppery overtones that would suggest more than 10% whole bunch fermentation. The persistence and potential longevity are exciting. Bénigne picked from October 8th until 11th, waiting to get best phenolic ripeness which he could as the grapes had stayed healthy. It was a small crop, albeit up from 17 hectolitres per hectare in 2012 to 22. He vinified at normal levels of extraction, using 10% of whole bunches from his old vines. 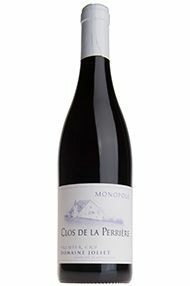 Displaying attractive raspberry fruit and the recognisably spicy character of Clos de la Perrière, this has excellent length, stretching out very well to the back of the palate. The fruit is on the cusp of red and black, suggesting ideal ripeness. It is a wine of both character and quality. There are certain sites up and down the Côte d’Or which have been recognised for centuries as being outstanding locations. The monks were usually the first to spot the potential and to stake a claim. One such is the Clos de la Perrière in Fixin, just north of Gevrey-Chambertin, founded by the monks of Cîteaux in the early 12th century. Various early wine authorities in the 19th century singled out Clos de la Perrière as an exceptional vineyard, Dr Lavalle (1855) noting it as a Tête de Cuvée, making wines which kept for longer than any others of the Côte d’Or. The Joliet family purchased the Manoir de la Perrière and its attendant vines in 1853. Bénigne, the 6th generation of the family, has moved towards organic farming in the vineyards, reduced yields and developed a style of vinification and barrel maturation to suit this vineyard. From the 2009 vintage the wines are aged for 24 months in barrels, half one-year-old and half two-year-old. The soil, high on the hill above Fixin, needs an extra week to ripen the grapes, so Bénigne began on 13th September, achieving 13% natural alcohol. The 2015 has a beautiful purple colour with a heady, deep raspberry note on the nose, yet maintaining the lightness of touch which Bénigne seeks. This is a very fresh, delicious, juicy wine, full of vibrant raspberry and cherry fruit which will develop floral notes, and with the excellent length which is characteristic of the vintage. A wine which will drink well young or old. Drink 2019-2030. The whites were picked three days before the reds here, with very light vinification, using 100 percent whole bunches except for the grapes from the coolest section of the vineyard (nearer the woods at the top of the hill). The crop was reasonable, at just over 30 hl/ha and the wines are being raised in 25 percent new wood over a minimum of 18 months. The label has been revitalised to reflect Bénigne’s Grand Cru ambitions for his wine. Bénigne continues to pursue his goal of Grand Cru recognition for his wonderfully positioned five-hectare vineyard. 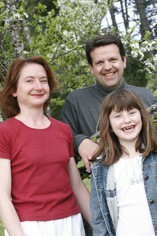 He now has the support of the local growers’ association to make the application but he knows it will be a long battle. The Grand Cru battleground is in Nuits-St Georges for the moment. Nevertheless, there is something special happening here: do not be deceived by what appears to be the simpler Fixin appellation. Tasting the three vineyard elements separately (south – fruity but with a core of stern fruit; under the forest – ripe violet and blackcurrant; north – crunchy, good tannic structure) gave a wonderful insight to the wine’s final blend (an equal third of each), combining all those elements but also greater than the sum of its parts. The tannins are very silky, again defying the wine’s appellation. Drink 2020-2030. There are certain vineyard sites up and down the Côte d’Or which have been recognised for centuries as being outstanding locations. One such is the Clos de la Perrière in Fixin, just north of Gevrey-Chambertin, founded by the monks of Cîteaux in the early 12th century. Dr Lavalle (1855) noted it as a Tête de Cuvée, making wines which kept for longer than any others of the Côte d’Or. The Joliet family purchased the Manoir de la Perrière and its attendant vines in 1853. Bénigne, who has bought out other family members so as to be able to run the domaine as he wants, is the sixth generation of the family. There was some frost damage on the higher vineyards which reduced the yield to 22hl/ ha, and only 70 percent whole-bunch used this year. There was very light extraction, as always, with only three punch-downs during the three-week fermentation, and very little pumping over. The wine will spend two years in barrel, with 20 percent new oak.